The legendary John Mayall - "The Godfather of British Blues" once again "delivers the goods" on his latest release, Talk About That, on the Forty Below Records label. The 11-tracks of pure blues pleasure featuring John Mayall, guitarist Rocky Athas, bass guitarist Greg Rzab, and drummer Jay Davenport, with a guest appearance by guitarist Joe Walsh will have you talking about the release, Talk About That, for a long time. John Mayall - Talk About That was produced by John Mayall and by Eric Corne, and engineered and mixed by Eric Corne on the Forty Below Records label. John Mayall had his hands in all parts of the pie, and even designed the album packaging. With his latest release, John Mayall - Talk About That (release date January 27, 2017) Blues Hall of Fame Member, and OBE (Order of the British Empire) recipient, John Mayall (born on November 29, 1933) demonstrates that at age 83, he has no intention of slowing down. The release features 11 fabulous tracks, all but 3 (It's Hard Going Up, Goin' Away Baby, Don't Deny Me) written by John Mayall, with Across The County Line co-written by John Mayall and the band (Rocky Athas, Greg Rzab, and Jay Davenport). Longtime Blues fans already know the score; John Mayall's impact on the world of Blues has been stratospheric. For those new to this legendary musician, composer, and bandleader, his former band, The Bluesbreakers included such legendary luminaries as Eric Clapton, Peter Green, Mick Fleetwood, John McVie, Jack Bruce, Mick Taylor, Harvey Mandel, Walter Trout, and Coco Montoya, to name but a few of the "who's who" of talent he has played with over the years. As with excellent vintages of wine, John Mayall just keeps getting better with age. Recorded at the House of Blues Studio in Encino, California, the release opens with the title track, Talk About That. 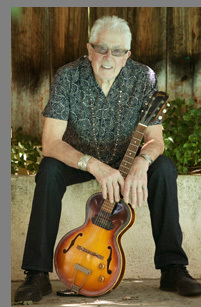 John Mayall notes, "When I first had the idea for the title track, "Talk About That," I wanted to write lyrics that were about aspects of life that were running through my head. I also wanted to give the song a modern groove that would convey the fun mood driving the piece. Greg and Jay laid down a really infectious rhythm for me to feature my keyboard chops and bring the song to life with a really funky feel driving it." Talk About That opens with the saucy lyrics, "I'm a good-looking fellow, some women tell me so..." that sets the tone for the song and for the rest of the release, where you know that John and the band are going to have some fun. Next in the line-up is the catchy Bettye Crutcher song, It's Hard Going Up (and twice as hard coming down) which has a fabulous Blues Jazz intro. John and the band slow the pace and slide into the song, The Devil Must Be Laughing as easily as a hot knife through butter, featuring special guest Joe Walsh on guitar. John Mayall notes about The Devil Must Be Laughing, "A day before we recorded (the song) we got a message from the studio owner that Joe Walsh wanted to come by and possibly play on a track or two as a guest. Who was I to say no to that idea! So, Joe turned up at noon on the appointed day and with only a quick listen, plugged in and we did the song in one take. The second song, (Cards On The Table) followed, and with a smile and a quick photo, Joe was on his way. What a kick for all of us that day!" Joe Walsh notes of the experience, "It has been a bucket-list item since 1970 to play with John Mayall. Finally got the chance - and he was the complete gentleman and fine, fine musician I had always hoped he would be. When you meet a hero, who helped shape your career - it's a wonderful feeling to find that they're even cooler than you always thought they were." For the listener, the combination of John Mayall and Joe Walsh on The Devil Must Be Laughing and Cards On The Table make for a dynamic addition to a very collectible release. Close your eyes as John Mayall takes listeners to Bourbon Street in New Orleans with the Mayall song, Gimme Some Of That Gumbo, that has enough chops to satisfy the need for some New Orleans style Blues and features a three-piece horn section that makes this song a standout. Bring your appetite and your parade parasols; you will not leave hungry after giving this song a listen to at least twice to get your fill. John Mayall's harmonica intro paves the way for the James A. Lane (Jimmy Rogers) song, Goin' Away Baby before the band continues with two more Mayall songs, the Funky Blues, Cards On The Table, and I Didn't Mean To Hurt You. Other great songs on the release are Don't Deny Me by J.L. Williams, and the John Mayall song, Blue Midnight. The collective effort of John and the band shines effortlessly on the group-written song, Across The County Line. The release aptly closes with the John Mayall song, You Never Know, where the opening lyrics implore "You never know how your life is going to be ..." featuring some fine piano and lyrics that will leave you with lots to ponder. For John Mayall followers, this release marks the last recording as a Mayall quartet line-up, as Rocky Athas has left to pursue a solo career. 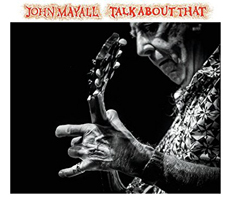 The band is now a trio with John Mayall, Greg Rzab, and Jay Davenport, so grab yourself a copy of John Mayall - Talk About That to add to your Blues collection. © January 2017. Luxury Experience. www.LuxuryExperience.com All rights reserved.